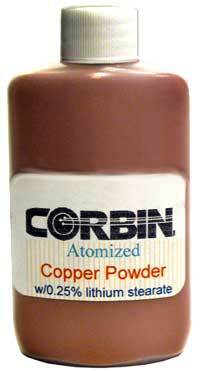 CUP-8 Atomized Copper Powder is used to make non-lead bullets with a density about 2/3 that of a lead core bullet. The copper powder compresses well under moderate swaging pressures, and forms a solid that can be handled. Typically the powder is compressed inside a bullet jacket. If not, the compressed bullet needs to be sintered (heated in an oven to fuse the grains together). It will then shrink slightly, so the original swaged bullet needs to be made over-sized. Exact diameter control normally comes from running the sintered bullet through a draw die as a final step.